It’s hard to believe that a baitrunner reel packed with 7 of the newest age technological features can sell in the low $100 dollar range. Shimano begs to differ and delivers proof packaged in a line of reels known as the Shimano Baitrunner D Spinning Reel Series. 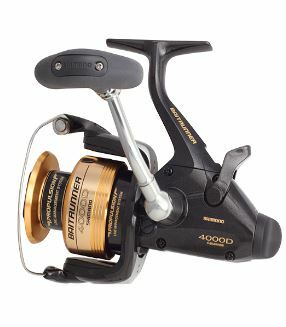 The Shimano Baitrunner D Series offers medium sized saltwater reels. 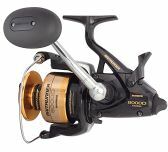 These reels are available in four models ranging from 4000 – 12000 in Shimano size charts. Line capacity starts at 8 lb mono/15 lb braid on the BTR 4000D. It goes as high as 20 lb mono/80 lb braid on the 12000 model. Drag resistance that maxes out at 20 lbs is more than enough to battle tuna and jack in the 20 – 50 lb weight range. Many technologies invented by Shimano overlap between reel models. The Shimano Baitrunner D and the Shimano Sedona FD reels provide the perfect example. The biggest difference between these reels is the larger size of the Baitrunner D. Below is a list and explanation of Shimano Baitrunner D features. Super Stopper II: A proper name for an anti reverse mechanism. One bearing has the sole purpose of eliminating any back play in the spool. S A-RB: These are the standard anti rust bearings used by Shimano. The S stands for the metal shield which covers the bearings and helps keep out debris. Aluminum Cold Forged Spool: The process of cold forged aluminum produces a stronger product than die cast aluminum. Dyna-Balance: The Shimano Baitrunner D makes use of a counter weight on the rotor. This feature works to balance the spool throughout the retrieve which prevents wobble and vibration. Fluidrive II: This technology makes use of a large main gear shaft and precision cutting for exact teeth lay. The teeth are then polished so that their entire surface area makes contact with the gear. This adds incredible gear strength which leads to a smoother and easier retrieve. Varispeed: The cam shaft used in most rotating gears is straight. The usual result is an inconsistency in rotation speed, and is why the line stacks up on top and bottom of the spool. The Varispeed technology uses an oval cam which helps maintain a consistent spool rotation. It ensures even line lay on the spool. 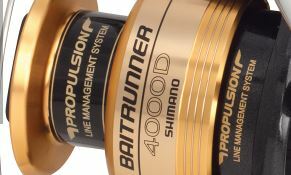 Propulsion Line Management System: Another Shimano treasure in technology that revolves around the top lip of the spool. Thousands of computer monitored casting tests eventually led to this special lip design. It enhances casting distance while simultaneously preventing backlash and wind knots from forming. The baitrunner feature is the obvious stand out and it’s worth mentioning, especially for those that may not be familiar with such a mechanism. Baitrunners allow a temporary free spool condition without having to flip the bail. The mechanism is activated by the flip of a switch and comes with a knob to set the exact amount of line resistance desired. Bait is then able to swim, freely pulling out line until the switch is flipped back which returns the spool to full gear. The Shimano Baitrunner D series of reels make a fine and affordable addition to any saltwater collection. Fishing live bait from the deck of a boat is what these reels are made for, though they are by no means limited to that situation alone. Fishing the surf, lagoon, pier, or jetty are fine examples of when you can apply these reels. Shimano Baitrunner D reels show off their versatility in fresh water applications. They make capable tackle for targeting salmon, lake trout, carp, or any other large size freshwater species. Finally, it’s important to point out that the baitrunner feature can go unused in any situation where it’s not required. The Shimano Baitrunner D offers a great price for the package, but the baitrunner feature isn’t necessary for many fishing styles. The baitrunner can easily go unused but can also add an unnecessary cost. The Daiwa Opus offers an alternate reel that’ll go anywhere the Shimano Baitrunner does, minus the baitrunner. The 3 bearing and 1 anti reverse bearing employed by Shimano Baitrunner D reels is a simple system. More bearings doesn’t always mean a better reel, but 3 is a bit low. The gear ratio can also present an issue if you require a fast retrieve while jig fishing. The Shimano Baitrunner D reels have a ratio of 4.8:1, which isn’t terrible but does fall short in some circumstances. It’s fantastic if you can afford to invest in expensive reels. The Penn Torque or a jump up to the Daiwa Saltiga Dogfight make the wish list of many a fisherman. The fact is that the greater majority of fishermen don’t have that kind of budget. The Shimano Baitrunner D Series Spinning Reels offers top of the line value in a cost vs. performance evaluation. Shimano’s advanced technology goes far when examining these reels. Any frequent saltwater live bait fisherman interested in a baitrunner spinning reel would have a hard time not biting on the Shimano Baitrunner D.